We propose a new continuous-time contracting model, in which the firm value process can only be observed with noise, and there are two sources of moral hazard: the agent’s effort and misvaluation. The principal can induce the agent to alter the perceived fundamental value of the firm through misvaluation, thus changing the market estimate of that value. We consider two cases in detail: the one in which the market correctly anticipates only the effort, and the other in which it correctly anticipates both the effort and the amount of misvaluation. In the first case, we find that it is optimal for the principal to induce the agent to apply a non-zero amount of misvaluation. 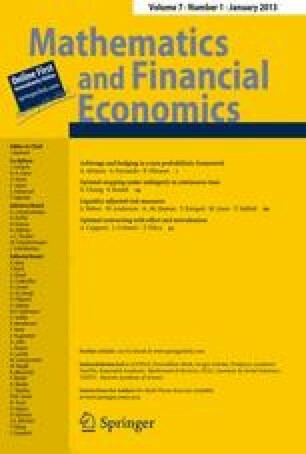 Using calculus of variation techniques, we find the optimal pay-per-performance sensitivity (PPS) of the contract and optimal effort and misvaluation amount, by means of solving of a second order ordinary differential equation. In the second case, which can be viewed as an extension of the seminal Holmstrom-Milgrom model to the case of noisy observations, we find that the optimal misvaluation value is zero, and we compare the resulting optimal contract to the Holmstrom-Milgrom contract.